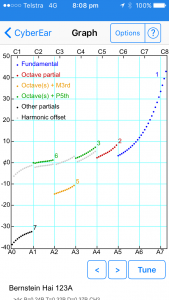 So what makes a great piano tuning? 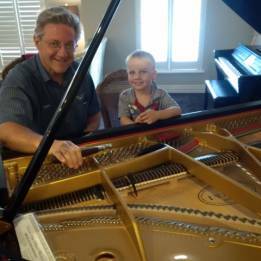 I think understanding the piano being tuned and having a full knowledge of tuning. There are several parts as i see it. Piano manufactures scaling. That is the tension on the string by the thickness of the string by the length of the string to achieve the frequency and tone of the note. That takes us to the voice of the piano. Some pianos are manufactured to give a bright harsh tone and some a soft mellow tone. One is not right and the other wrong. people have their own tastes in tone. I was talking to John Clarke designer from Mason & Hamlin and he said that He makes the Mason to sound like a Mason so that the following of Mason will have the same tone when they upgrade their piano. I am sure other manufacturers do the same thing. that is why some People love and some hate Yamaha or Kawai sound. With cars it is the same some like Ford others like Holden. 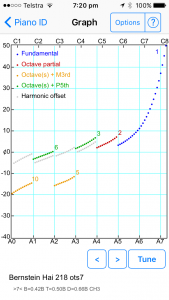 So then we look at Octive Tuning Stretch. (OTS). This will depend on what the customer wants. Most would have no idea. 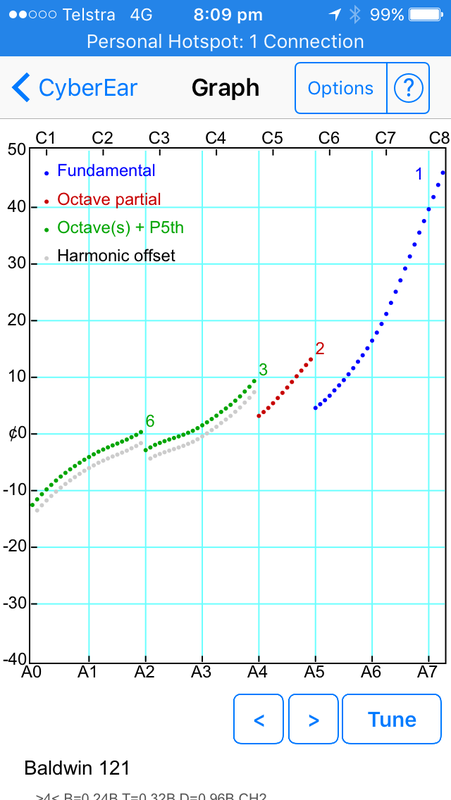 However if i ask the customer what sort of music they like that will tell me what Octive Tuning Stretch they would like. If they like contemporary music then an OTS of 4 is what they will be happy with. 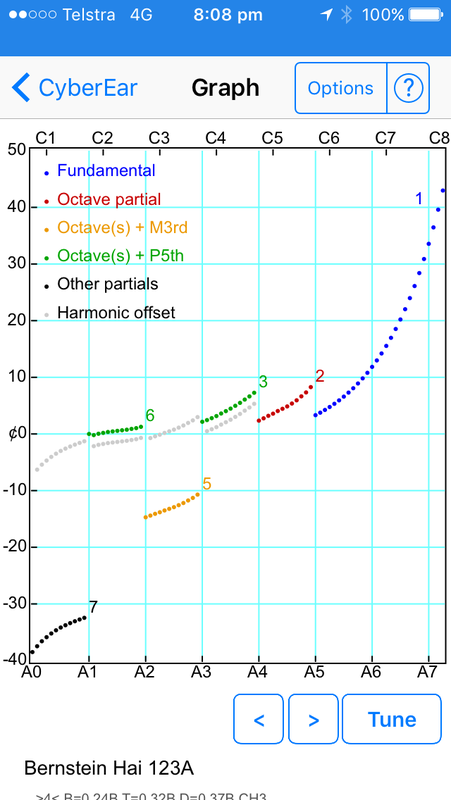 If they like Clasicial music then an OTS of 1 with pure octaves will be more of a liking for that customer. then we have the JAZZ lover’s they get off on an OTS of 7 or 8 depending on the size of the piano. These pictures are from my Cyber tuner graph. The left one is ots 7 and the right is ots 1. Just in case you were wondering why the Bass is at -20 cents and the treble is +35 to +45. The human ear hears flat in the treble and sharp in the bass. so we need to tune sharp in the treble and flat in the bass. 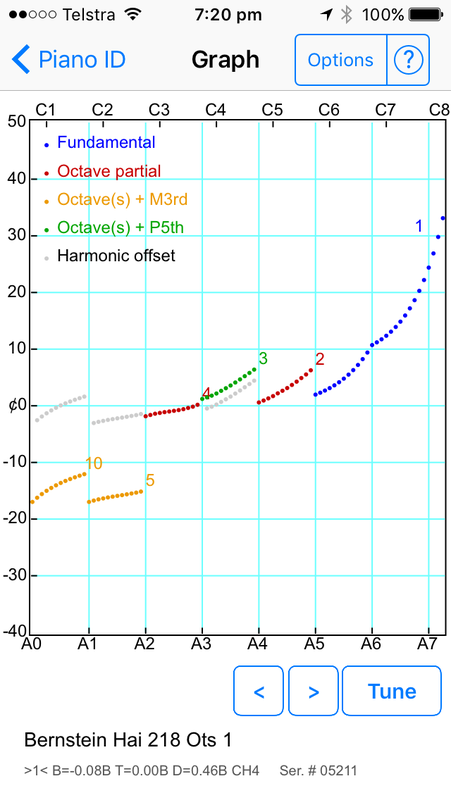 When I was ear tuning this happened naturally. Get a computer involved and you have the put stats in a box. This is why the early electronic tuners sounded gosh awful. Gave electronic tuning a very bad name. So then we have the question of How big is the piano? Is it a grand or an upright and how high or long is it and what difference does this make? Well if I tune a 1 meter high spinet piano to OTS 7 it is going to sound gosh awful. So experience tells me what OTS will sound good on that size piano. Now we look at Unison’s. Pianos have one string per note from A to A1 then A1 to the first break have 2 strings per note and then to the top of the piano there are normally 3 strings per note. Getting the 2 and 3 string notes to sound the same is what we call getting the unison’s right. Even a badly scaled tuning can sound OK with good unison’s. 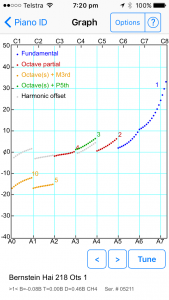 So weather the tuner uses and Cheap or an expensive electronic tuning device. 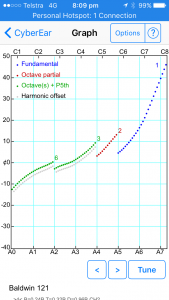 Knowing how to use it is crucial to achieve a great tuning. I personally use the most expensive tuning device. The Cyber Tuner is what i use and at $1600 it is cheap for what it does for my tuning. If your piano is below pitch and you want it on pitch the Cyber Tuner will calculate the amount of over pull needed to have the tuning sound great with only one pass. The Ear Tuners don’t have this benefit. They will do a pitch raise then a tuning. so will take the twice as long to tune the piano. Just a comment in here. False strings are a nightmare for the young tuner. False strings have a beat when sounding on their own. I need to tune these with their mates to get the best sound possible using my Ear. In the treble using a digital tuner if the strings are tuned separately the note will sound out of tune. A digital tuner will get each string true but when they are played together their is a beat in the note. Tricky exercise using both Digital and Ear tuning is best in this situation. At one of the tuner conferences I attended the speaker said that in the treble on some pianos you can tune the first string true. Tune the second string true. Play them together and they will be flat. Interesting. this can be a trap for young tuners. So this brings us to Pitch. Concert pitch is the pitch near A440 that a conductor or 1st violin will tune an orchestra to. 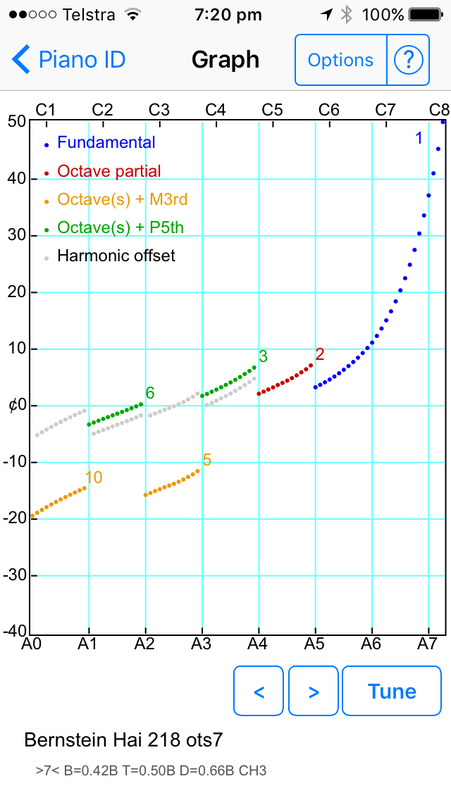 I call A440 Standard pitch and this is what fixed tone instruments are tuned to. Like Organs, better Keyboards. Cents are the the measurements for music and 100 cents is the measurement between 2 notes on the piano. so if i was to say the piano is 100 cents flat then it is one note flat. Ok, so you want your piano tuned. do you look for the cheapest price or the tuner with the most experience. this is your choice and depends on how you value your piano playing experience. I haven’t talked about Regulation. This is how the piano plays. Touch, heavy or light. Notes playing evenly. There is a lot in this so I will do another blog on this.